Canadian sales of commercial vans jumped 6% to more than 2400 units in January 2017 despite the continued decline of small commercial van popularity. Led by the Ford Transit Connect, small commercial van volume plunged by a third in January after falling flat in 2016. For the Ford, it was the lowest-volume month since April 2014. For the larger Ford Transit, however, January volume jumped 39%, pulling the full-size commercial van sector up 22%. 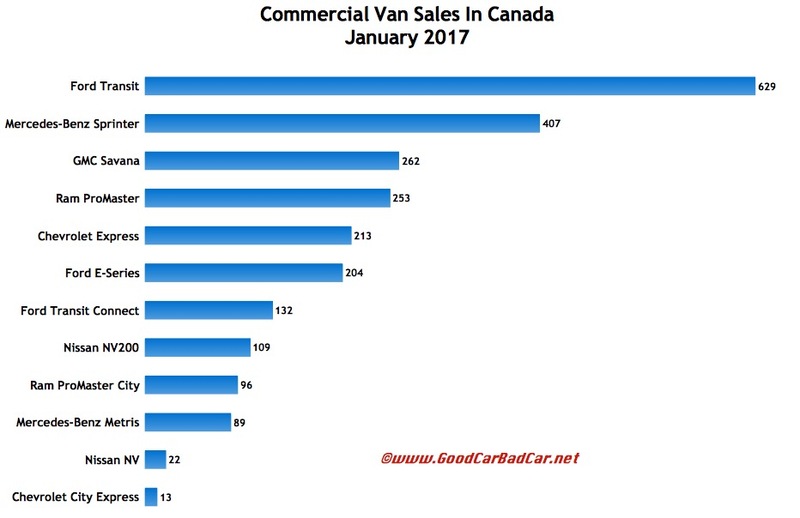 Full-size commercial vans produced 82% of all commercial/cargo van sales in Canada in January 2017, up from 71% one year ago. Not only did Transit sales rise, but Mercedes-Benz Sprinter volume doubled. Ram ProMaster volume similarly nearly doubled, rising to 253 units.